This year's Tech Talk sessions at Google I/O cast light on a few key ingredients necessary for developing great software and applications, including faster methods and techniques, a re-envisioning of how to do things better, down to a robust architecture that is designed to scale and sustain. At the same time, developers themselves need to successfully manage the growth of new ideas in a collaborative environment, while remembering to put the user and customer first. Kicking off Tech Talks at Google I/O this year, Steve Souders challenged developers to build faster, high-performing websites and presented a few best practices and tactics to these ends. Dhanji Prasanna and Jesse Wilson revealed the fast, lightweight Guice framework and how it is used at Google to power some of the largest and most complex applications in the world. Dion Almaer and Ben Galbraith walked the audience through the Bespin project at Mozilla Labs in their session, expanding on the project's core motivation to re-envision how we develop software and to provide pointers on what it takes to build bleeding edge applications for today's browsers. Jacob Lee unveiled the architecture behind Mercurial on BigTable, a new version-control component of Project Hosting on Google Code that was built to host hundreds of thousands of open source projects. Brian Fitzpatrick and Ben Collins-Sussman ran a duet of talks that turned the focus from the tools to the developer. First, they discussed the myth of the "genius programmer" in the social dynamics of collaborative software development. In a subsequent session, they talked about the lost art of putting the user first and "selling" the software in an exciting and honest manner through usability and uncomplicated design. Keeping with the focus on developers and what motivates developers to action, we invited Brady Forrest to run an Ignite session at Google I/O, featuring nine speakers with deeply interesting perspectives on technology. Topics ranged from growing up a geek, big data and open source, and the law of gravity for scaling, to life as a developer at the frontlines with a humanitarian agency. 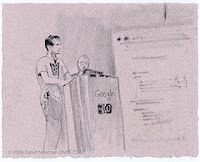 We also wanted to share one of our favorite tidbits from Google I/O -- a series of ink on paper portraits by David Newman, an ex-courtroom sketch artist (now enthusiastic technologist!). David put his brush to paper at the conference floor and drew wonderful sketches of a few of the folks at I/O - we're delighted to share a few of his portrait sketches. We hope you enjoy this year's interesting combination of perspectives at the Google I/O Tech Talks series, now available online. Watch the blog next week as we bring live more videos and presentations from the breakout session tracks at Google I/O!